They say there have been eight worlds before ours. Eight times the people of this Earth, over vast millennia, built their civilizations. They reached heights we cannot even imagine now: they spoke to the stars, reshaped the creatures of the world, and mastered form and essence. They built cities and machines that have since crumbled to dust, leaving only their vast outlines and barest remnants. 416-page corebook with poster map replaces the original Numenera corebook and has everything you need to play. Complete, streamlined game rules for a fast-paced, story-based tabletop roleplaying game experience. An intuitive, concept-driven character generation system, with scores of options for building just the character you imagine. Detailed information on a vast swath of the unique and compelling Ninth World setting. A bestiary of more than fifty creatures and characters. 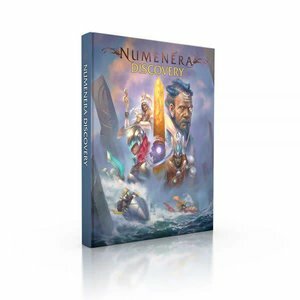 Hundreds of unique numenera items. Four complete adventures to launch any campaign. All existing Numenera supplements remain compatible with the new corebooks.